According to my research, of the 28,877 properties in Aylesbury, 13,469 of those properties have mortgages on them. 88.5% of those mortgaged properties are made up of owner-occupiers and the rest are buy to let landlords (with a mortgage). 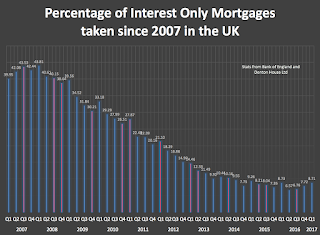 … but this is the concerning part .. 2,909 of those Aylesbury mortgages are interest only. My research also shows that, each year between 2017 and 2022, 35 of those households with interest only mortgages will mature, and of those, 9 households a year will either have a shortfall or no way of paying the mortgage off. Now that might not sound a lot – but it is still someone’s home that is potentially at risk. Theoretically this is an enormous problem for anyone in this situation as their home is at risk of repossession if they don’t have some means to repay these mortgages at the end of the term (the typical term being 25 to 35 years). Banks and Building Societies are under no obligation to lengthen the term of the mortgage and, when deciding whether they are prepared to do so or not, will look at it in the same way as someone coming to them for a new mortgage. Back in the 1970’s and 1980’s, when endowment mortgages were all the rage, having an endowment meant you were taking out an interest only mortgage and then paying into an endowment policy which would pay the mortgage off (plus hopefully leave some profit) at the end of the 25/35-year term. There were advantages to that type of mortgage as the monthly repayments were lower than with a traditional capital repayment and interest mortgage. Only the interest, rather than any capital, is paid to the mortgage company - but the full debt must be cleared at the end of the 25/35-year term. Historically plenty of Aylesbury homeowners bought an endowment policy to run alongside their interest only mortgage. However, because the endowment policy was a stock market linked investment plan and the stock market poorly performed between 1999 and 2003 (when the FTSE dropped 49.72%), the endowments of many of these homeowners didn’t cover the shortfall. Indeed, it left them significantly in debt! Nonetheless, in the mid 2000’s, when the word endowment had become a dirty word, the banks still sold ‘interest only’ mortgages, but this time with no savings plan, endowment or investment product to pay the mortgage off at the end of the term. It was a case of ‘we’ll sort that nearer the time’ as property prices were on the rampage in an upwards direction! 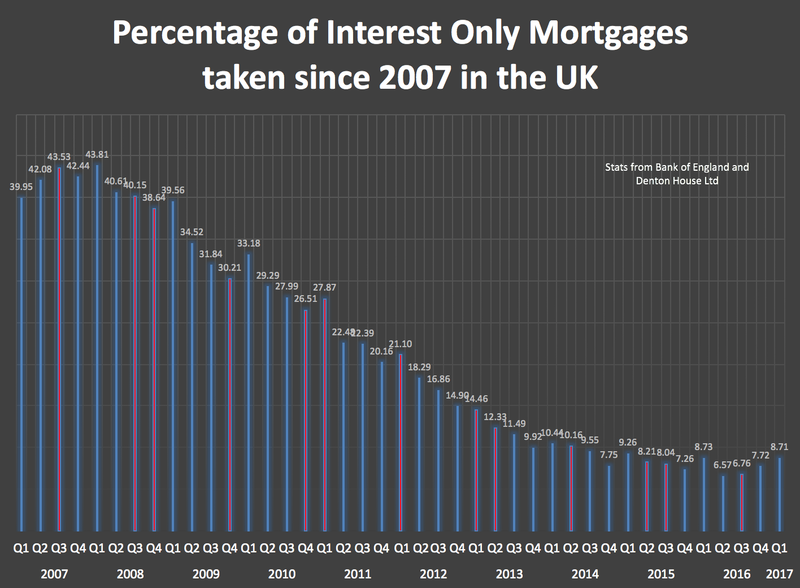 Thankfully, the proportion of interest only mortgages sold started to decline after the Credit Crunch, as you can see looking at the graph below, from a peak of 43.81% of all mortgages to the current 8.71%. Increasing the length of the mortgage to obtain more time to raise the money has gradually become more difficult since the introduction of stricter lending criteria in 2014, with many mature borrowers considered too old for a mortgage extension. Aylesbury people who took out interest only mortgages years ago and don’t have a strategy to pay back the mortgage face a ticking time bomb. It would either be a choice of hastily scraping the money together to pay off their mortgage, selling their property or the possibility of repossession (which to be frank is a disturbing prospect). I want to stress to all existing and future homeowners who use mortgages to go in to them with your eyes open. You must understand, whilst the banks and building societies could do more to help, you too have personal responsibility in understanding what you are signing yourself up to. It’s not just the monthly repayments, but the whole picture in the short and long term. Many of you reading my blog ask why I say these things. I want to share my thoughts and opinions on the real issues affecting the Aylesbury property market, warts and all. If you want fluffy clouds and rose tinted glasses articles – then my articles are not for you. However, if you want someone to tell you the real story about the Aylesbury property market, be it good, bad or indifferent, then maybe you should start reading my blog. Well last week’s article “The Unfairness of the Aylesbury Baby Boomer’s £4,187,830,000 windfall?” caused a stir. In it we looked at a young family member of mine who was arguing the case that Millennials (those born after 1985) were suffering on the back of the older generation in Aylesbury. 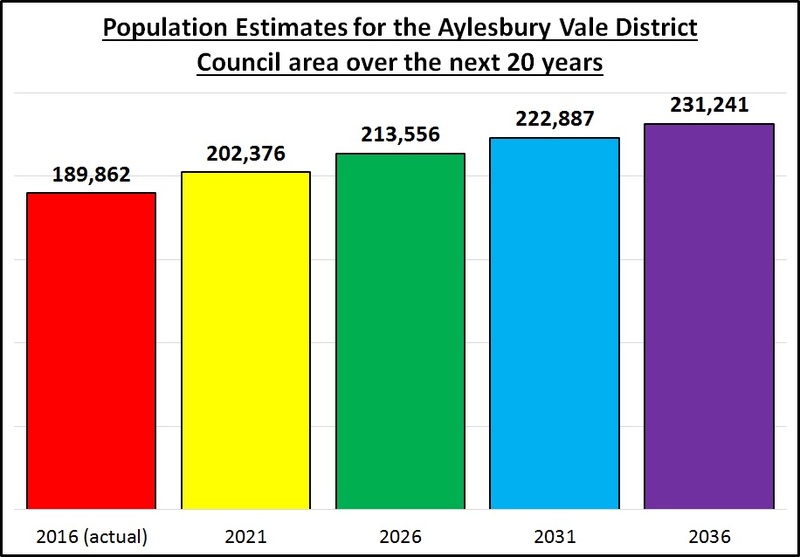 They claimed the older generation had seen the benefit of the cumulative value of Aylesbury properties significantly increasing over the last 25/30 years (which I calculated at £4.19bn since 1990). In addition many of the older generation (the baby boomers) had fantastic pensions, which meant the younger generation were priced out of the Aylesbury housing market. I responded that there should be no surprise though that the older members of our society hold considerably more of our country’s wealth than the younger generation. This wealth is accrued and saved across someone’s lifetime, and reaches its peak about the time of retirement. If we are to comprehend differing wealth levels between generations we need to compare ‘apples with apples’. It is much more important to track the wealth held by different generations at the same age, i.e. what was ‘real’ wealth of the 30-something couple in the 1960’s compared to a 30-something couple say in the 1980’s or 2010’s? Looking back over the last 120 years at various economic studies, this growth in wealth from one generation to the next (at the age range), only happened over a 30 year period of between 1960 and late 1980’s. Since the 1990’s, wealth has not improved across the generations, in the same age range. So could it be all about these people saving? The fact is, in the last 10 years, UK households have saved on average 7.5% to 8% of the household income into savings accounts, compared to an average of 6% to 7% in the late 1960’s and 1970’s. 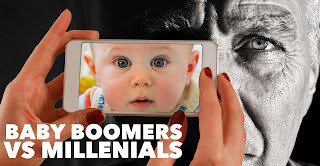 The baby boomers haven’t been actively squirreling away their cash for the last 30 or 40 years in savings accounts to accumulate their wealth. Most of their gains have been passive, lucky bonuses gained on the back of things out of their control (unanticipated and massive property value rises or people living longer making final salary pensions more valuable) – it’s not their fault! ...and herein lies the issue … it is assumed that these Millennials aren’t buying property in the same numbers like the older generation did in the past (because most of their wealth has come from house price inflation). The Millennials have often been described as ‘Generation Rent’, because they rent as opposed to buying property – because we are told they cant buy. 95% first-time buyer mortgages were reintroduced in 2010. The average interest rate charged for those 95% FTB mortgages has slowly dropped from around 5.5% in 2009 to the current 4% rate. Back in the 1980’s/1990’s mortgage interest rates were between 8% and 10%, and one time in the early 1990’s, reached 15%! The main difference between the two periods was the absolute borrowing relative to income is greater now than in the 1980’s. They call this the ‘mortgage to joint household income ratio’. In the 1980’s the mortgage was between 1.8x to 2x joint income; today it is 3.4x to 3.6x salary. The simple fact is, in the majority of cases, it is still cheaper for a first-time buyer to buy a property with a 95% mortgage, than it is to rent it. The barrier for these Millennials, has to be finding the 5% mortgage deposit – instead of being able to afford monthly mortgage outgoings at the current 95% mortgage rates? Nonetheless, the majority of Millennials in the area still do rent from a landlord (3,700 Millennial households to be exact). Yet, they have a choice. Buckle down and do what their parents did and go without the nice things in life for a couple of years (i.e. the holidays, out on the town two times a week, the annual upgraded mobile phones, the £100 a month Satellite packages) and save for a 5% mortgage deposit ... or live in a lovely rented house or apartment (because they are nowadays), without any maintenance bills and live a life with no intention of buying (because renting doesn’t have a stigma anymore like it did in the 1960’s/70’s (secretly hoping their parents don’t spend all their inheritance so they can buy a property later in life – like they do in central Europe). Neither decision is right or wrong – although it is still a choice. Until Millennials decide to change their choices – that is the reason why the country’s private rental sector will continue to grow for the next 30 years – meaning happy tenants and happy landlords. So, I got talking over a glass of lemonade with them and a couple of their children, about the times of 15% interest rates and how the more mature members of our family had to endure the 3 day week, 20% inflation and the threat of nuclear annihilation in 4 minutes ... , foolishly, I said that with all the opportunities youngsters had to day, they had never had it so good! Trust one of their children to have gained some financial/economics qualifications before going to Law School, as they debated with me the genuine economic predicament of Millennials and how a combination of student debt, unemployment, global proliferation, EU migration and rising house values is reducing the salaries and outlook of masses of the UK’s younger generation, causing an unparalleled disparity of wealth between the generations. So of course I asked why that was? 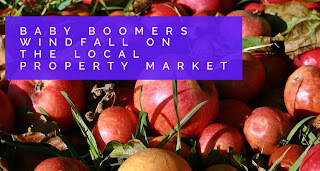 Bringing it back to property, the young ‘soon to be’ lawyer, stated that baby boomers born between 1945 and 1965 have been big recipients of the vast rising house prices over the 1970’s/80’s/90’s and 2000’s. Add to that their decent pensions, meaning cumulatively, their wealth has grown exponentially through no skill of their own. 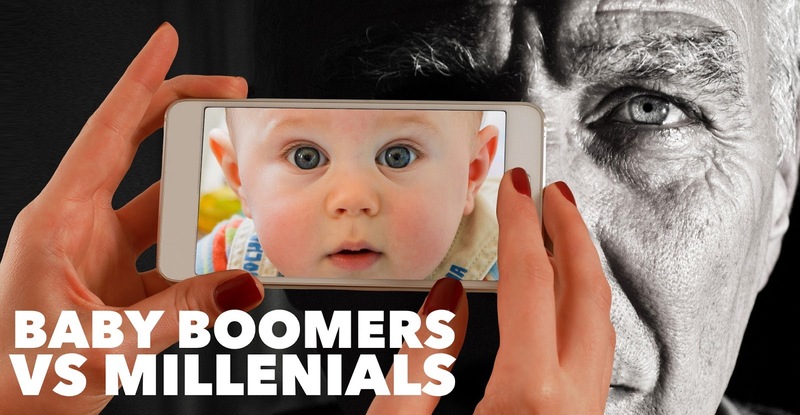 This disparity of wealth between the older and younger generations could have unparalleled consequences for the living standards of younger Millennials…. So – do we have a problem?? 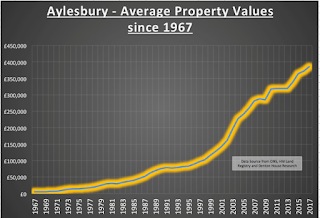 Since 1990, the average value of a property in Aylesbury has risen from £102,800 to its current level of £385,800. As there are a total of 14,798 homeowners aged over 50 in Aylesbury; that means there has been a £4.19bn windfall for those Aylesbury homeowners fortunate enough to own their own homes during the property boom of the 1990s and early 2000’s. I must admit that the growth in property values in the 1990’s and 2000’s certainly helped many of Aylesbury’s baby boomers. The figures do appear to put into reverse gear the perceived wisdom that each generation gets wealthier than the previous one … and so with all this wealth, the figures do back up the youngsters argument that Millennials are being priced out of home ownership. In article 2, I will carry on this discussion where I will give you the Baby Boomer’s defence to the prosecution’s case! 50 years ago, in 1967, the first human heart transplant was performed by Dr Christian Barnard in South Africa. In the same year Sweden switched from driving on the left-hand side to the right-hand side of the road. The average value of an Aylesbury property was £5,111, interest rates were at 5.5% and The Beatles released their Sgt Peppers album ... but what has that to do with the Aylesbury property market today? Quite a lot ... so with my CD player turned up loud - let me explain! I have been doing some research on the current attitude of Aylesbury first-time buyers. First-time buyers are so important for both landlords and homeowners. If first-time buyers aren’t buying, they still need a roof over their heads, so they rent (good news for landlords). If they buy, demand for Aylesbury property goes up for starter homes and that enables other Aylesbury homeowners to move up the property ladder. The average value of an Aylesbury property is currently standing at £385,763 and UK interest rates at 0.25%. As each year goes by, it appears the age of the everlasting mortgage has started to emerge, prompted by these first-time buyers, eager to get a foot on the housing ladder. 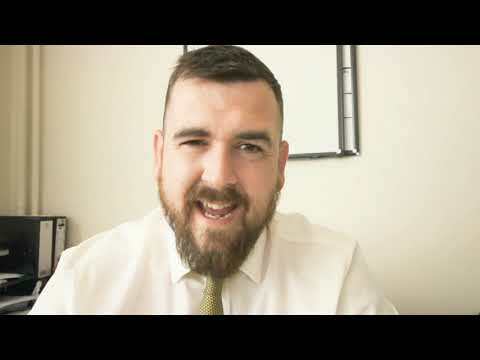 I was reading a report a few days ago where some mortgage companies confessed that the battle to gain big returns from the property market has led to mortgages that will take considerably longer than the customary 25 years to pay off. Over the last few years, it has been commonplace for first-time buyer mortgages to be 30 and 35 years in length and the ‘Bank of Mum and Dad’ have been helping with the deposit. Now, some high street banks are offering mortgage terms of 40 years. This means first-time buyers could be paying until their mid. So, a 50-year mortgage does not seem as far-fetched now as it would have been back in the 1970’s. After all life expectancy for a male then was exactly 69 years and today its 79 years and 5 months! However, some observers have said there are worries the mortgage companies are lending money over such a long term, they threaten leaving some first-time buyers with a generation of debt if the house price bubble bursts. 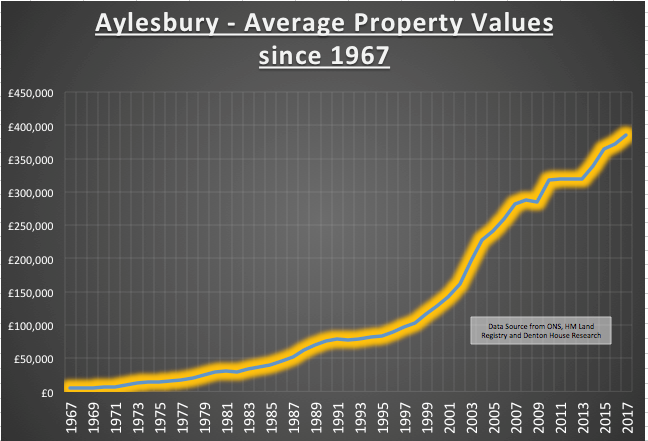 Interestingly, when I looked at what had happened to average property values in Aylesbury over the last 50 years, there have been bubbles. First-time buyers should take heart, since as a country we have always recovered from it a few years later. What if interest rates rise? 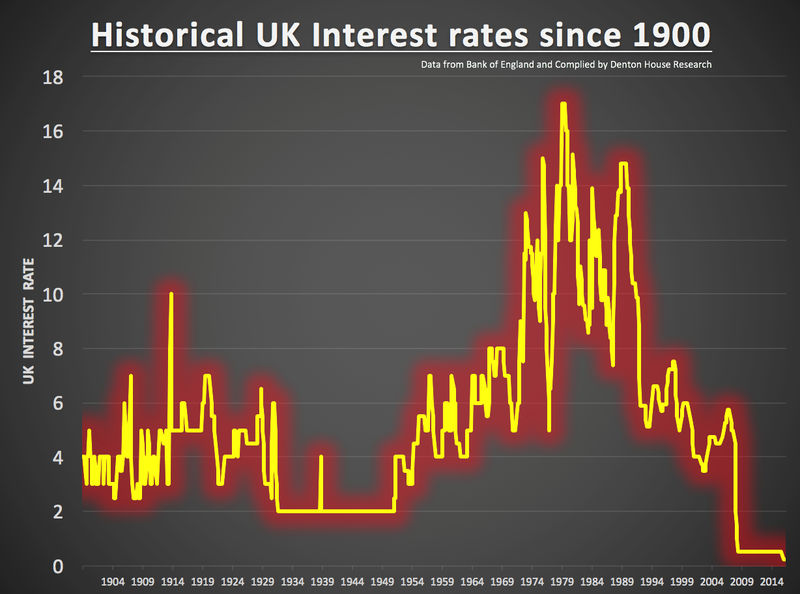 Well looking at historic UK interest rates, the current rate of 0.25% is at a 300-year low. Mortgages will never be cheaper. 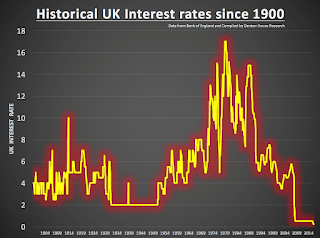 I would however, seriously consider fixing the rate to cushion any future potential interest rate rises (since they can only go in one direction when they do change). If Aylesbury first-time buyers see buying a home as a long-term decision, based on the last 50 years, they should be just fine! Before I go, a final thought for property buyers in Sweden, the land of Volvo and Abba. As Swedish property prices are so high, Swedish Regulators announced last year limits on the length of Swedish mortgage terms. They don’t bother with 50-year mortgages (On and On and On – Abba). No, our Volvo-loving Swedish friend’s average mortgage length is 140 years (this is not a typo). Although such mortgages have had their Waterloo (Abba), regulators have significantly reduced the maximum term of a Swedish mortgage to 105 years. Either way, that’s a lot of Money, Money, Money (Abba again – Sorry!) to pay back! Now I will leave you in peace as I listen to the 1980’s Madness song ‘Our House’. On several occasions over the last few months, in my Aylesbury Property Blog, I predicted that the rate of rental inflation (i.e. how much rents are rising by) had eased over the last year. At the same time I felt that in some parts of the UK rents had actually dropped for the first time in over eight years. Recent research backs up this prediction. Rents in Aylesbury for new tenancies fell by 0.4% in the last 12 months (i.e. not existing tenants experiencing rental increases from their existing landlord). When we compare that current rate with the historical rental inflation in Aylesbury, an interesting pattern emerges.. The reason behind this change depends on which side of the demand/supply equation you are looking from. On the demand side (from the tenants point of view) there is the uncertainty of Brexit and the fact that salaries are not keeping up with inflation for the first time in three years. Critically this means tenants have less disposable income to pay their rent. As an aside, it is interesting to note that nationally, rent accounts for 29% of a tenant’s take home pay (Denton House). On the supply side of the equation (landlords point of view) Brexit also creates uncertainty. However, the biggest issue was a massive upsurge of new rental properties coming on to the market in late 2016, caused by George Osborne’s new 3% stamp duty tax for landlords in the first part of 2016. This meant a lot of new rental properties were ‘dropped’ on to the rental market all at the same time. The greater choice of rental properties for tenants curtailed rental growth/inflation. A slight softening of Aylesbury property prices has compounded this. Figures from The Bank of England suggested that first time buyers rose over the last 12 months as some were more inclined to buy instead of rent. Together, these factors played a part in the ongoing moderation of rental growth. The lead up to the General Election in May didn’t help: after all people don’t like doubt and uncertainty. So now that we have a mandate for going forward over the next 5 years hopefully that has removed any stumbling blocks stopping tenants making the decision to move home. Whether it be ‘hard’ or ‘soft’ Brexit negotiations (and with the Election result the Tory’s might have to be ‘softer’ on those negotiations) the simple fact is, we aren’t building enough properties for us to live in. Both in Aylesbury, the South East and the wider UK, long-term population trends imply that rents will soon be growing faster than inflation again. Look at the projections by the Office of National Statistics. Tenants will still require a vibrant and growing rental sector to deliver them housing options in a timely manner. As the population grows in Aylesbury, and wider afield, any restriction to the supply of rental properties (brought about by poor returns for landlords) cannot be in the long-term best interest of tenants. Simply put rents must go up! The fact is that I see this as a short-term blip and rents will continue to grow in the coming years. With rents only accounting for 29% of a tenants’ disposable income, the ability for most tenants to absorb a rent increase does exist.